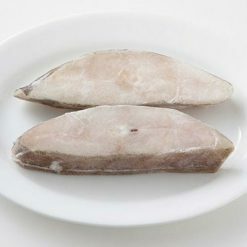 This North Atlantic halibut was cut using the “tsutsu-giri” cutting method, with the bones and fat intact. Product totals 160g (2 pieces). This halibut is very fleshy and fatty. The bones and fat intact make for a very nutritious stew, and an excellent broth. The edge of the fish is also still intact. The pre-cut halibut makes it easy to use in a fish stew. You may also add celery, onions, tomatoes, leafy greens and even other seafood, such as shrimp. Tsutsu-giri is the cutting of fish into cylindrical shapes. The head is cut off, and the stomach and viscera are removed- which makes it easier to instantly use this ingredient. The fish is washed, then cut and sliced along the bone in circles. 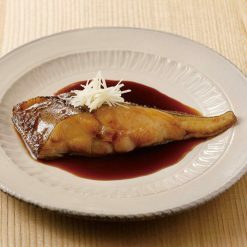 Other fish where tsutsu-giri cuts are appropriate include eel, mackerel, carp, salmon, and other tube-bodied fish. Please thaw the dish in the refrigerator. If in a hurry, simply thaw the fish by placing its bag under running water in the sink. After thawing, please be sure to wipe off any excess moisture. Boil a pot of water, including all seasoning, and put the halibut into the pot upon bringing the water to a boil. Bring the water down to a simmer when preparing the halibut. Put the lid on the pot and occasionally stir. You may also prepare this dish by foil grilling, grilling after marinating, or frying.Please be sure to serve the halibut carefully, so as to not let the fish meat crumble. This is possible by keeping the fish together using a toothpick or the like. As a serving suggestion, season 2 pieces of halibut using 2 tablespoons of dashi, 1 tablespoon of sake, 1 tablespoon of sugar and boiling in 100 ml of water. This product contains greenland halibut (North Atlantic). Greenland halibut (North Atlantic). Prepared and packaged in China.